The sports editors of the Interlake Spectator and the Express Weekly News have selected Aardvark’s Gunner Gislason as winner for the 2016/17 Bill Masterton Memorial Trophy, which is awarded to the player who best exemplifies the qualities of perseverance, sportsmanship and dedication to ice hockey. 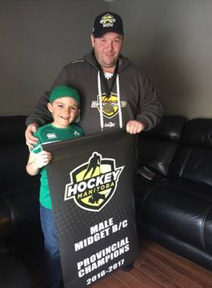 Gunner may have played a career low 25 games this season, but he still tallied 35 goals while coaching the Teulon Midgets to the Interlake league title and gold in the Manitoba Midget B/C Provincials. With Gunner’s coaching success, the Aardvarks have a tough decision to make for the 2017/18 season, to assign Gunner behind the bench as their coach or on the bench as a player. Either way, Gunner’s presence is greatly reflected in the Aardvarks success.